All four review cases are well-priced for value, quality, and marketplace competition. Note: Each case covers the scroll wheel in a slightly different way, somehow without sacrificing scrolling or clicking. 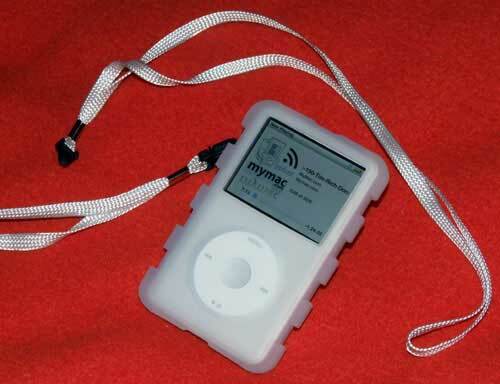 ezSkin Classic for Apple iPod Classic is a thin, flexible, slip-in silicone sleeve with cutouts for access to HOLD/ON, EARPHONE, and DOCK CONNECTOR ports, plus a window that precisely covers the iPod’s display. A plastic screen protector is provided, with narrow adhesive along its edges, to keep the display in pristine condition. I chose not to use this protector. A removable belt clip and neck strap are included, that add more bulk that I desired for this particular ultra thin case. This ezSkin case is easy on an iPod exterior, and easy on the fingers when using doing scroll wheel activity. The silicone fit is snug, and remains so after many removals and insertions. I’m fond of this case, use it frequently, and give it our MyMac.com 4.5 out of 5 rating recommendation. 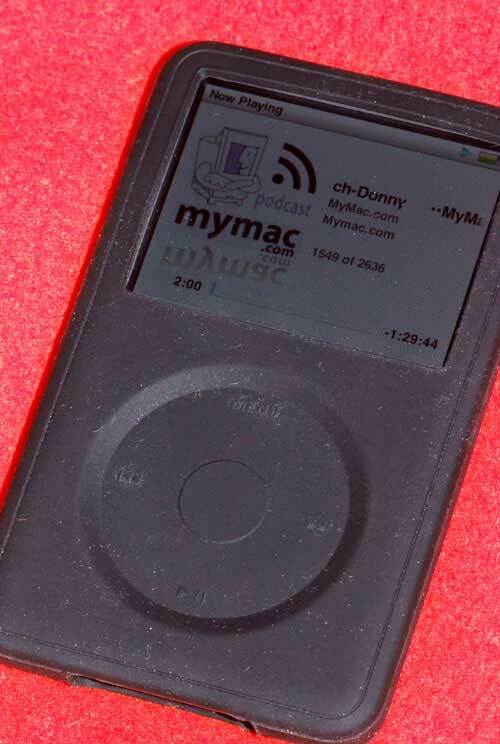 ezSkin MAX for iPod Classic is a more hefty version of its slim sibling. MAX has thicker silicone, plus five bumpers along each narrow left and right rim. Fit is not as snug as in the ezSkin Classic model reviewed above, and the docking port opening at bottom is twice as large as in ezSkin Classic, due to the thicker material in MAX. When extra protection is required, ezSkin MAX is a valid choice, for only $5 more than the Classic ezSkin iPod cover. I use ezSkin MAX with a belt clip and strap for outdoor activity, and it deserves a strong 3.5 out of 5 rating. Defender Series OtterBox for iPod Classic has a two-piece snap-together inner rigid plastic shell, complete with clever clear membrane cover for iPod screen and scroll wheel areas, and four standard port openings. 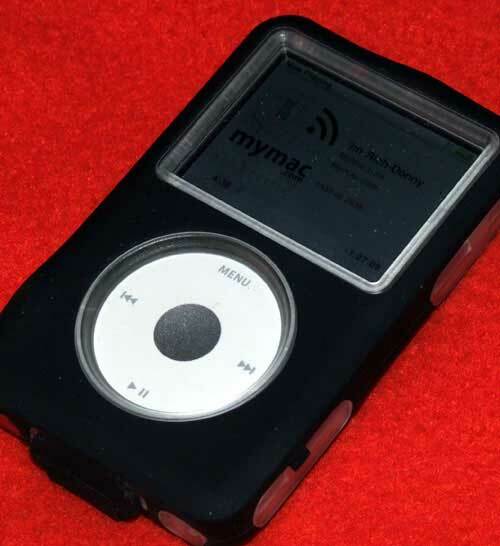 Once the iPod is within this plastic shell, a black silicone outer sleeve slides over it. This sleeve is similar to the ezSkin Classic, with a notable addition. OtterBox for iPod Classic is an all-weather case, with tuck-in flaps that gently seal every port and snap fitting of the rigid inner shell. Only time will tell if OtterBox’s flaps and plugs are durable enough for years of abuse by active lifestyle iPod owners. 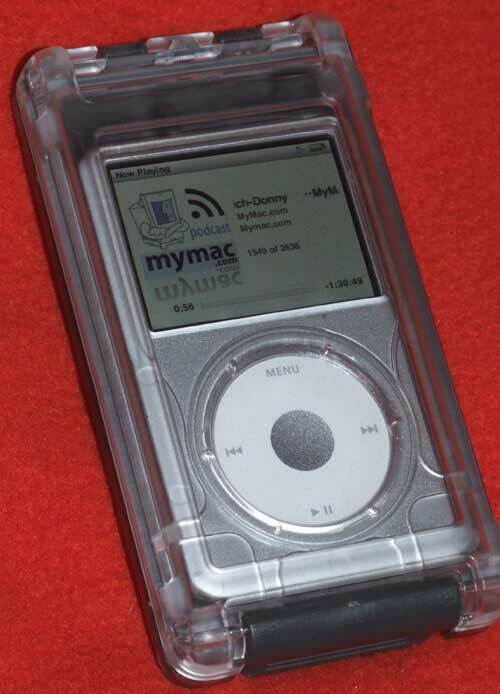 I’ll be using Defender Series OtterBox for iPod Classic as my primary case during the next rainy month, for its strength and versatility, and I expect it will earn our MyMac.com rating of 4 out of 5. Unsnapping and snapping the plastic inner shell is a bit tricky. Be patient when learning how to do it, so you don’t damage either the case or your iPod. 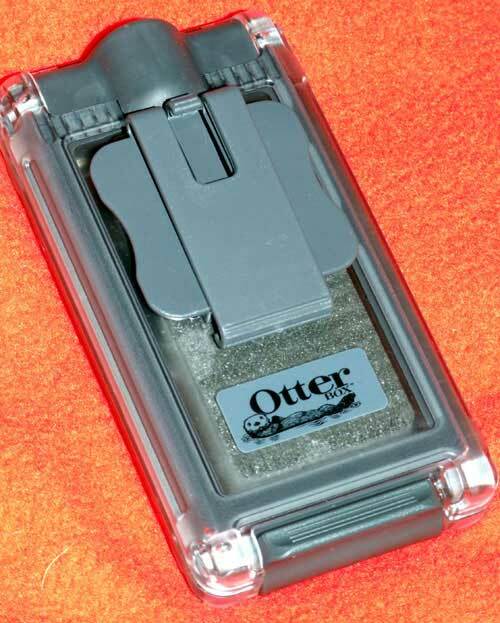 Once both plastic and silicone components of this OtterBox are in place, your iPod is secure and safe. 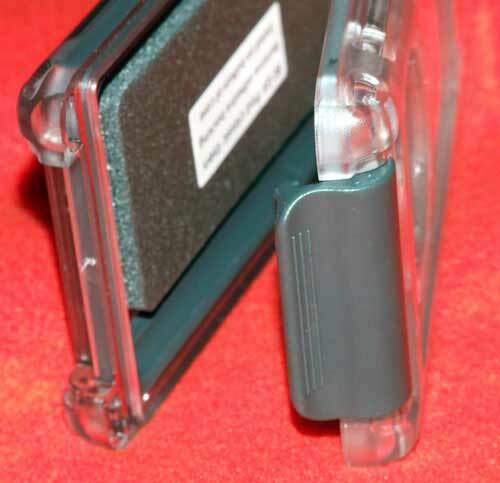 Armor Series OtterBox for iPod Classic is the most secure and protective iPod case we’ve seen. It’s the direct descendent of OtterBox’s indestructible laptop computer case, described and pictured here. A secure offset headphone jack is the only opening to the outside world, once the case is clamped shut. No charging, docking, or ON/HOLD button access is possible. 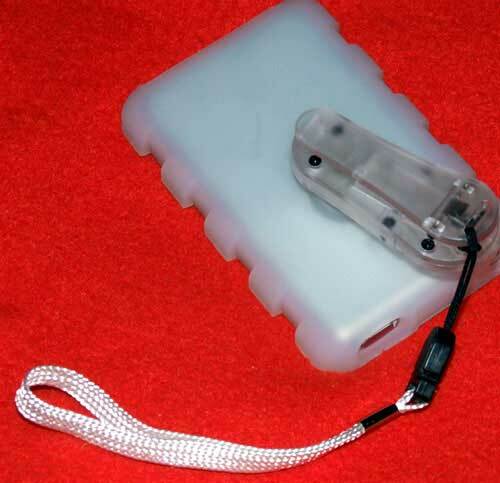 Your iPod is safe from the elements, and can be used for playback just about anywhere in the world except underwater. This Armor Series enclosure is large, bulky, and awkward, but scroll wheel access and operation are straightforward due to an ingenious membrane cover that is easy to demonstrate but difficult to describe. When you want the ultimate in iPod physical coverage, everything else is in last place. In a bar fight, OtterBox’s Armor iPod case would say, “Hey, pal, wanna take it outside for a little rumble? !” and return shortly afterward without a scratch. Company literature claims correctly “the Armor series protects devices so you can take your technology virtually anywhere, rain or shine!” As long as you understand this case is listen-only, and must be opened to the elements for all other functions, you’ll agree it deserves our recommendation and 4.5 out of 5 MyMac.com rating. A spring-loaded removable belt clip is the only accessory.